Hi, I am Honey. My husband is Scott. We have a 6 year old son, Lyric, and a new baby girl, Maren. Maren was born on February 13, 2012. She weighed 8 pounds and 6 1/2 ounces. Twelve days after having taken Maren home, on a Saturday, and while at our son’s friend’s birthday party, we received an urgent call from a doctor asking about Maren’s wellbeing. We then learned she had an abnormal result on a newborn screening, elevated C3, which could indicate a metabolic disorder. A couple of days later, we received a call from a genetic counselor from Denver Children’s Hospital who informed us that Maren was diagnosed with Propionic Acidemia. Maren shows no signs of her illness. She did not “crash” in the hospital and has not since. She is a month old now. 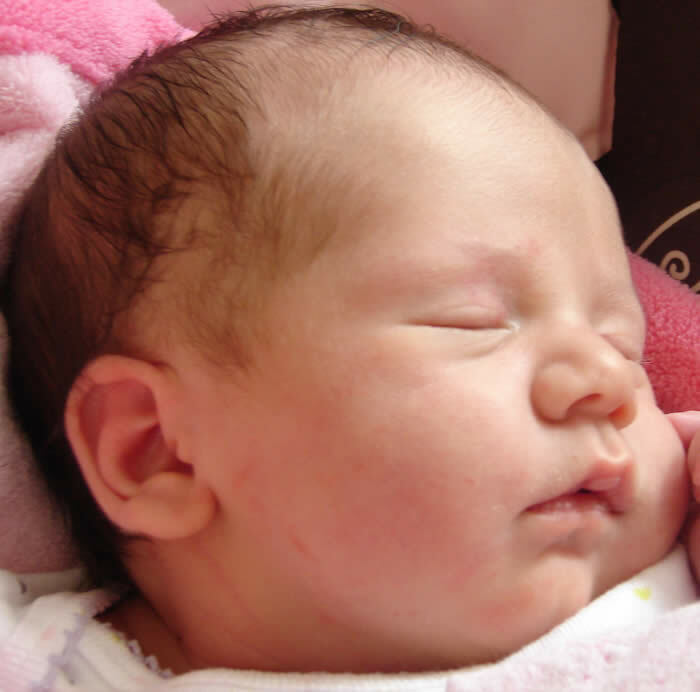 Maren’s little body was fed for almost 15 days a typical newborn diet of breast milk and formula. She had no abnormalities in her urine while having this. We feel so lucky she was able to hold her own. She now has a team of doctors and a special formula that includes carnitine as well. Needless to say, as a family, we are devastated. We are slowly coming to grips with our new reality. She is a precious little girl and naturally we fear what’s to come. We are still learning about PA. Looking at Maren one would never guess what’s going on in her fragile little body. She appears to be just fine. As many other “seasoned” PA parents probably understand, we are in a pretty dark place having just been dealt this blow. We are scared, overwhelmed and shocked slowly making our way towards acceptance and looking for the strength to persevere and smile while doing it. It feels like an impossibilty right now. We are new to this community. We are willing to share our story and to hear from others. Maren is now almost 3 months old. So far, so good is what I have to report. Maren has been doing wonderfully. We have made friends in other PA families since her diagnosis which has proven to be a blessing. Recently Maren had a diet change which included adding a large amount of protein back into her baby formula. This was scary, but everything is okay so far. Labs showed that Maren was severely low in 2 amino acids and just fine with the other 2. We struggle with her lab draws since she is so little and finding a vein seems to be quite a challenge. We have learned as a family and through the support of others to take each day as it comes. Learning to keep our fear in check is an ongoing lesson though. Doctors suspect that Maren has a “mild” form of PA. But, that is always prefaced with “only time will tell.” Maren is a sweet, happy, and strong baby!